Born Free is set to undertake its biggest lion relocation to date after the rescue of four lion cubs from captivity in France. It is now appealing for funds to give the four cubs, known as the Lions of Lyon, a lifetime home at its big cat sanctuary in South Africa. 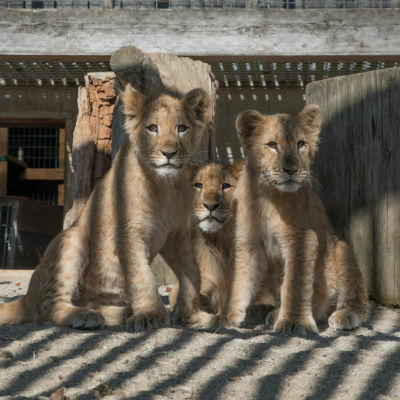 The four cubs – Horus, Kuuma, Dadou and ‘Girl’, who is yet to be named – are only a few months old, and are believed to have been taken from their mothers before they were weaned. They were rescued from lives facing terrible suffering, and were found to be battling various ailments. ‘Girl’ is the smallest and youngest of the cubs at about five months old. She was surrendered by her owner and was very unwell. She had glaucoma, and was underdeveloped and underweight, with extreme hair loss and diarrhoea. ‘Girl’ is now doing much better - her hair has grown back and she is slowly gaining weight. Her legal case is ongoing. Thanks to the intervention of the French authorities and Born Free’s partners Fondation 30 Millions d'Amis, the cubs have now all be transferred to a safe location near Lyon while they await their transfer to Born Free’s big cat rescue centre at Shamwari Private Game Reserve in South Africa. There, they will receive lifetime care in a safe, spacious and enriching environment, surrounded by the sights and sounds of Africa. You can help send the Lions of Lyon home to Africa. To find out more and make a donation, click here.